It can’t come quick enough. For those non runners amongst my followers, a taper is not a candle (although yes, technically it is). In running parlance, it’s the two/three weeks before a big run when you can start to cut back on your distance running in order to preserve your legs and avoid injury or as I once saw it described “an opportunity for the mind and legs to rest, recover and prepare”. Yes, I know it’s just the lull before the storm but I’m looking forward to missing out the long run, or just the fact that the long run becomes a short run (in comparison). In theory I have only three more weeks of trying to push myself closer to that 21k mark. And then I can cut back to 5/6k runs. I’m aiming to get as close to 19k as I can during “training” and then rely on sheer willpower to get me across the finish line on the day. I seem to recall the last few kilometres of Paddock Wood are through a residential area so perhaps I can focus on the nice houses and front gardens and hope that distracts me (or was that a different race!?). Today I tried to do my long run, my Jantastic target this week is 16.5k. I try to get it out of the way as soon as possible because then I know it’s done and dusted, and today the elements seemed to be in my favour – opportunity and weather all looking good. But, guess what, too hot! It’s not the end of February yet and I’m already complaining that it’s too hot. Heaven help me come July/August. I started off with good intentions, had my route in mind but I veered off that route after 6k to avoid running up a hill which I thought would beat me. So I went off down another reasonably flat road albeit knowing that if you go down, at some point you have to go up. I was just banking on the going up not being quite as steep as the going up being avoided. I’m not too sure what happened but at 8.5k I gave up. I’m putting this down to one of four things. Possible dehydration – I’d not drunk much in the past 18 hours and I hadn’t taken any water with me despite knowing I was going to be out for some time. The “heat” – I had decided to be brave and on departure had only adorned two layers as opposed to the current usual of three but I had to shed one of those layers part way around and my naked arms were exposed to daylight for the first time this year. When I say that I don’t mean my arms haven’t seen daylight so far this year, they just haven’t seen outside daylight. Phew, that would be a bit smelly! Lack of music – I usually use music to distract me when running on my own but Paddock Wood is a no music zone and I decided I’d better get in practice running longer distances in relative silence. And then finally possibly the real culprit – my attitude!!! Yes, I have been dreading this run all weekend even though it was only an extra 1500m up on last week’s long run and I managed that okay. 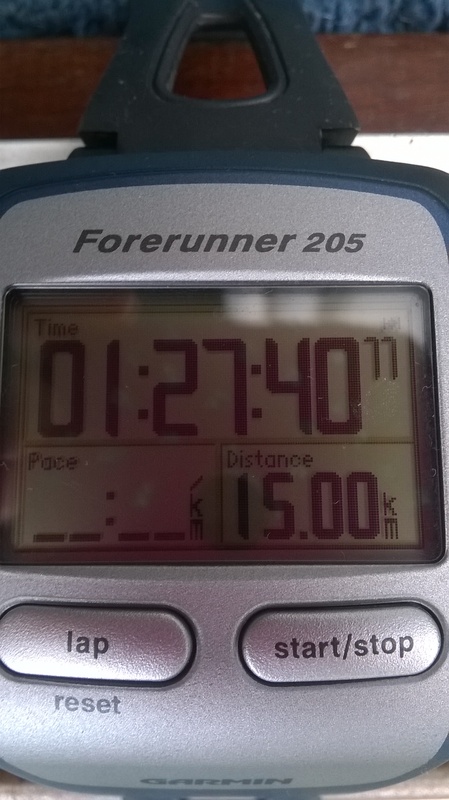 I even tried telling myself, “16.5k – that’s three parkruns and a little bit”. I knew it had to be done and have literally spent hours thinking of all the different routes I could do to get to the target – and even then I didn’t follow any of the routes I’d dreamed up! At the end of the day, I knew it was going to be tough, so it was tough and therefore I gave up and failed. No amount of motivational runners’ quotes was going to save me today. So now the distance is still hanging over me and I have 5 days left in which to try again. I think next time I’ll have to go for an out and back route, no “if I just go around this bit and then back along that bit” tactics. I might have to run out to Higham and back (that was the original route). From memory that’s about the right distance although a bit undulating. But at least I can admire the views of the Thames and Essex en route. Motivation can be considered a driving force; a psychological one that compels or reinforces an action toward a desired goal. Motivation may be rooted in a basic impulse to optimize well-being, minimize physical pain and maximize pleasure. Hmm, so how does that apply to my running (or anyone else’s for that matter)? Well to start with you wont find me pounding the pavements before dawn – I’d trip up and I love my bed too much! And the second paragraph, where does that apply during the course of my run. I know running is helping to keep me healthy (I think) but I’m not sure about the minimizing physical pain and maximising pleasure bit, not during the run anyway! So at the moment, what is motivating me? Well I have to say Jantastic has been a revelation and a godsend. The weeks are counting down to Paddock Wood and although I’m sure I would have gone out training without Jantastic, the fact that I have to log my 4 runs a week and now record my long run distance spurs me on. I think I might have OCD tendencies – so much do I love logging my runs and ticking off my weekly mileage totals. I also love making lists and crossing things off. Perhaps I’m just a control freak? And parkrun is also motivating me to get out of bed on a Saturday morning, irrespective of the weather (so far). At the moment joining a running club would be a bit pointless for me what with work commitments but the pure joy (?) of running with other people is helping my speeds, I never do 5k on my own as quick as I do on a Saturday morning even when walking is involved. Entering races and chasing PBs, that helps to motivate me – I have this need to push myself to push myself (no, not a typing error, I have to push myself to push myself!). If that makes it sound like I’m doing races every month, I exaggerate. Only three booked so far for this year though there are several others in mind. If I fail again to get into the Royal Parks Half, I might try the first RunHackney half marathon, even if it is towards the end of June!? http://runhackney.com/ for anyone interested. Proof of my long run yesterday – the longest for over two years. So yesterday’s run ended up being extended just a little bit further than I had planned. I wasn’t intending to go far, just 5k, weather and clients permitted no more. It seemed the brief break in the weather didn’t just encourage me outside, there were lots of runners making the most of a dry if breezy spell. Had they, like me, had one eye on the weather and the forecast for most of the day and were out making the most of it? From indoors the wind looked a bit nippy so I layered up, donned my gloves and out I went. Nothing out of the ordinary happened and I did my run. But just as I approached home, I realised something was missing! Oh no, my running gloves, where had they gone? I’d had to dispense with their services mid-run and had zipped them up safely in my jacket pocket along with my front door key. Or so I thought! But somewhere en route the little blighters had jumped ship and gone AWOL. All other conceivable pockets and orifices were checked (twice) but no sign. They had gone, dear reader, gone! Decision time! Did I turn back to try to find them, they weren’t exactly expensive but would I be passing a Sweatshop before I next needed some hand protection? And indeed, would they have any left in stock, would they now be full to the gills of summer running gear? I swallowed my pride and went off down my front path again and back along the route I’d just taken. It had to be a bit more than a run/walk effort too, I had to save face. I couldn’t risk anyone who had just seen me running in one direction, then see me walking back in reverse, that would look like failure on an epic scale. 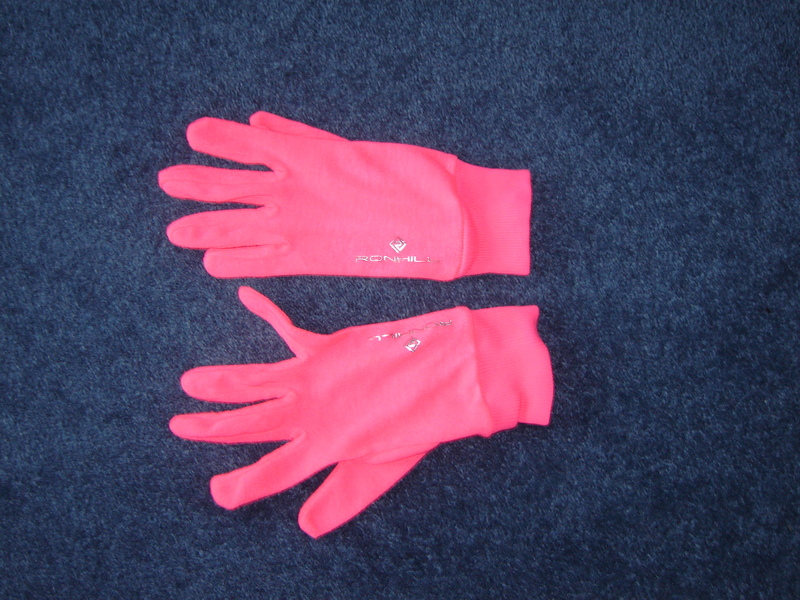 And then could I try to save a bit of time, could I really stop and ask passing strangers if they’d noticed a pair of neon pink gloves on their travels (the passing strangers’ travels, not the gloves)? Yes, neon pink – just in case I get caught in a snow drift whilst out running – as if!! So anyway, off I trot and it was a bit of a surprise to find I had a second wind, there was a bit more running than I’d anticipated – perhaps I should try a warm up in future, I don’t usually. I’d banked on the fact that my run had been fairly flat and fairly straight, I was expecting to spot the gloves a mile off – and I did, eventually! I know how it happened. My jacket has a front pocket and the zip runs parallel to the main opening zip. I got a bit hot at one point (no, not a hot flush, just down to energy expenditure) and undid the front of my jacket to cool off. I obviously opened the wrong zip and that must have been when they made their bid for freedom. But I couldn’t remember if that was before or after passing the man and his dog, or before or after the half way point so I had no reference point! Oh well, they have been retrieved unharmed to run another day and it could have been worse, it could have been my front door key that escaped. That would have been an awful lot harder to find. And just in case, I’m now investing in a length of elastic to attach said gloves to the cuffs of my running jacket! As I look out of my window, it’s not a nice view – heavy rain and blustery winds – but I wont complain because I know a lot of other places around the country are having it an awful lot worse. This morning I even saw cottages in Sole Street with sandbags out front. Perhaps it just seems worse because of the last few days of sunshine. On Sunday I went for a run around the A2 activity park and was absolutely amazed by the number of people out using the facilities. And I mean the park itself, not the Cyclopark – although that’s obviously a big success. I’m not sure whether this vast turnout was due to the weather or if it was because I usually run through the park during the week when it’s very quiet other than the odd dog walker. But it was great to see so many people outside and getting active – I can’t think of a better use for a former A road! I am lucky with my running surroundings. When I first started I used to keep to “urban” areas, running around the Gravesend streets, dodging in and out of traffic, in the belief that would be safer than more isolated areas. But now I’ve got a bit braver and not only do I have Shorne Woods a couple of miles away, the activity park is literally across the road and Jeskyns Park is just a short jog up a very steep hill!! I noticed when driving past said Park this morning that the new cafe is now open so time for a quick caffeine shot on my next venture inside. It’s probably two years since I last ran through Jeskyns but now I’ve found my running legs again I’m looking forward to getting back out there – although I might leave it a few weeks until (hopefully) the rain has stopped and the ground has dried out. Although I could keep to the paths, I do like to go “off piste” occasionally! And it’ll be good to see if any new structures have appeared and whether the alpacas are still in evidence. Women of Kent or Kentish Women? I understand Radio Kent had a phone in recently regarding a bit of a debacle about dog owners keeping their animals on leads when using Jeskyns. I have to say that in my experience both in Jeskyns and the activity park, the vast majority of dog owners are very respectful of runners and walkers and will always either reattach their dogs’ leads or at the very least call them to heel and keep them under control until I have passed. And I always try to engage with any upcoming dogs by smiling at them inanely in the vane hope that will prevent me feeling a sharp pain in one of my calves or if they’re a big dog, my gluteus maximus! It’s worked so far but maybe that’s just my inane smiling making them feel a bit uneasy and they are really cowering, waiting for me to hurry passed. But then again, perhaps the debacle is more geared towards dog on dog action! And you can interpret that anyway you wish!